Time for packing away holiday decorations and tossing out or donating other things we really don’t need. Our interior life needs to be decluttered, too, since we all struggle with “inordinate attachment” to things, outcomes, and even our relationships. Too often, these can take up our time and attention and block us from deeper intimacy with God. I tackle this topic in my new book, A Catholic Woman’s Guide to Happiness (TAN Books 2018) and use this childhood story to introduce the concept. Enjoy! Dear God, I really wanted that doll. 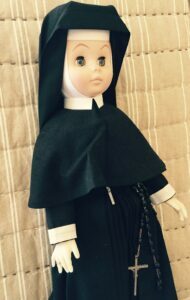 I was in second grade and for two weeks the most exquisite nun doll I’d ever seen had been on display in a glass case in the school’s principal’s office. The Sisters of Loretto had replicated a full black-and-white habit from top-to-bottom, including perfectly-scaled shoes and delicate white undergarments. At twelve inches tall, she was perfect. In May every year we had “Field Day”, a full play-day with no school activities and only fun and games and a grand prize raffle at the end of the day; this year it was the doll. The teachers instructed us that everything that day—hot-dogs, drinks, candy, game booth activities, and the raffle—required that we purchase tickets. No problem, I knew Mom would give me money. The night before the big event, I attempted something I had never thought possible: I decided to say an entire rosary. Five whole decades! I had never prayed this on my own; in class we would often recite just a decade at a time. But I wanted this prayer to be big. After all, my teacher had told us that the Blessed Mother would go to her Son on our behalf and, through his merits and mercies, she could obtain whatever we desired if we prayed the rosary. Whatever we desired. I’ll never forget lying in my bed that night, faithfully and fervently struggling to stay awake and complete the prayers. When I woke, it was Field Day! Arriving at school, my first task was to go to the desk where the eighth-grade students were selling tickets. “How much are the tickets, please?” I asked. When I walked away, I was happy, utterly thrilled at the possibility of possessing the doll of my dreams. But as the day progressed, I started to become hot, thirsty, and hungry. I couldn’t join my classmates in playing any games. I watched on the sidelines as my friends marched happily to music in a circle at the cake-walk. Others were fishing for prizes at carnival booths the dads had made. I wasn’t happy. To cheer myself up, I went to visit the doll again. My hopes quickly vanished when I saw the large raffle jar next to her was filled with what seemed like a million tickets. Mine were probably at the very bottom and my chances were slim-to-none at best. I suddenly felt foolish for having put all my money into the raffle. I knew I would not win. I’d given up food, drink, and fun for nothing, nothing, nothing! Self-pity followed me around the schoolyard the rest of the day as I suffered what I thought was authentic childhood martyrdom. Finally, three o’clock came with the event’s end and the big drawing. All the teachers and students crowded in front of the doll display and I was in the back trying unsuccessfully to peer over and through hundreds of older kids’ heads. Forget it, I thought. This is a waste. I’m just going to make my way to the parking lot and look for Mom’s car. Who cares, anyway. What? I couldn’t believe it! Some people try to steal our happiness. After school, while waiting for Mom to pick us up, I carefully laid my books and the doll down in the shade on the brick wall of the church and ran off to play with my friends. When I returned, the doll was gone. I panicked! Immediately I was filled with shame at having been careless and a “bad mom” for allowing my doll to be abducted. I burst into tears and Mom assured me we would get through this. Later, she told me that she’d called the school office and learned another little girl had taken the doll but, upon climbing into her mother’s car, could not explain how she got it. So, the doll had been promptly returned to the office. Whew! I got her back the next morning and never let her out of my sight all day. For many years I enjoyed my doll but when mothers of nine children decide there is too much stuff in the home, older toys and other items can get thrown away—often to the dismay of their young owners. It was sometime in early high school I realized my doll was gone. “Oh, it was old, and I thought you’d outgrown it,” was all my mother said. I was angry and sad but what could I do? My happiness came and went, came and went, and finally ended up in a trash heap outside town. But wait . . . there’s more: another surprise ending to the story, but you have to buy the book to find out. Get it here.